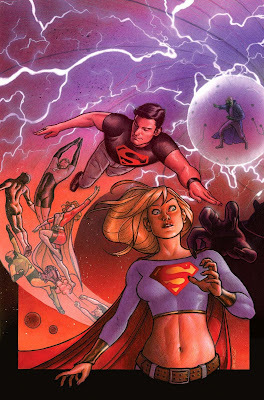 Hey Guys, here's a look at my most recent DC work, the cover to Adventure Comics #9. Here the editors on the book had expressed that they wanted this particular cover to feel a bit like a Drew Struzan movie poster. They had no idea who they were asking! I adore Struzan's work and had already done an homage piece to the artist back in college, so I was psyched. I broke out the airbrush and colored pencils and got cracking. I'd actually meant to take process pictures through the whole thing to show off just how it's done, but time constraints got in the way. Regardless, basically you start out with a rendered pencil drawing, to which you cut several masks through which you'll airbrush base layers of paint/color. Atop that, using the guideline of the underlying pencil rendering, you build up your light and darks with colored pencil. It's a little tedious, but also a lot of fun. 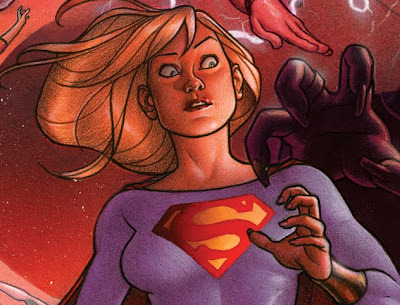 Here's a detail shot of Supergirl. And speaking of my college days, Paolo recently had a post on his blog where he mentioned our senior show in college, for which my Struzan/homage poster was created. Here's a link to a photo of Paolo and I and our show-mates attempting to re-enact our poses on the poster. I recommend you all check out Paolo's poster from the event as well (Yes, I'm wearing a dress there, but damn, I've got nice legs). sweet! your hard work paid off. always great to see comic guys using traditional media. Very Drew Struzen! You pulled off the look of his pieces pretty awesomely! I saw a step-by-step of his technique on James Gurney's blog, Drew makes airbrush look so easy. Is the cover available for sale? I love your work and Element Lad is my favorite Legionnaire. Please put it on hold for and check the price. Thanks! My Facebook page is Cayo Hern. Again, I'm sorry to hear about Noel. She looked like a great dog. I'd forgotten Paolo's poster art for your senior show. You were my favorite character! That is one great cover!